Pied Pier slot is a medieval themed game, telling the nursery rhyme of the famous pipe player, who led the rats away from the town of Hamelin in Germany. The light-hearted story has been told for hundreds of years and later turned into feature movies. However, I am more interested if this piper is going to lead me on a merry dance or whether I am likely to be tuning out. This 5 reel, 4 row, 40 payline slot game is laid onto a backdrop of a cartoon drawing of Hamelin, which is brightly coloured and has a warm and pleasant feel. As you would imagine the background noises are mainly made up of gentle flute music, interspersed with more trumpeting sounds when you land a win. There is a royal theme to the symbols, with King, Queen, Princess, Key and Money bags, along with the standard K-Q-J-10 making up any spare positions. Base game pays are relatively mediocre for 5-of-a-kind, as this game is all about the Wilds. The Pied Piper can appear stacked on reels 3, 4 and 5 and when he does he will trigger a base game feature that has some potential. Just as in the medieval tale, the Pied Piper leads the rats away. Should he appear on reels 3, 4 or 5 then he grants up to 5 re-spins as he makes his way left. With each re-spin he moves 1 reel, bringing the Rats with him, commonly known as Walking Wilds. The good news is the Rats are also Wild and sticky, so will follow the Piper all the way to the left. 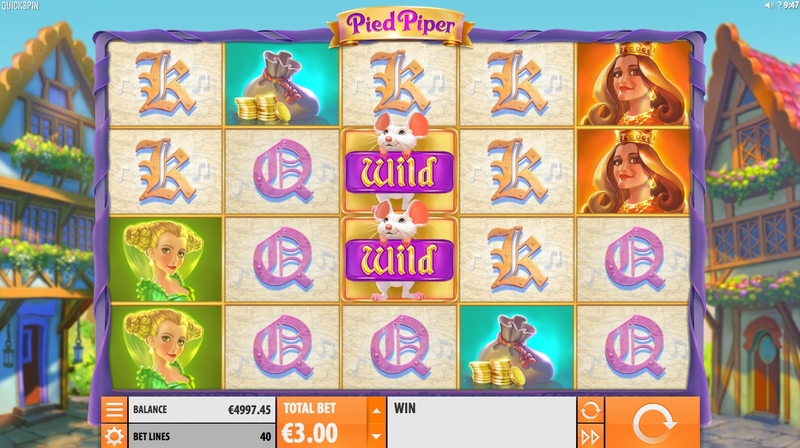 Get 5 Rat Wilds on a single pay line and you will be looking at 20x your stake, so this can work out pretty well if the piper hits the right notes! 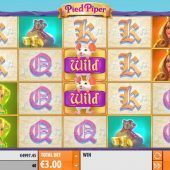 There is a free Spins feature in Pied Piper slot which is triggered by 3 bonus scatter symbols on the 3 middle reels, offering 10 free spins. This feature has a guarantee of between 1- 6 Rat Wilds on each and every spin, which can prove fruitful. The Pied Piper mystery re-spin is also possible in the feature and can be rewarding if he appears, as you have the guaranteed Rat Wilds in the feature.